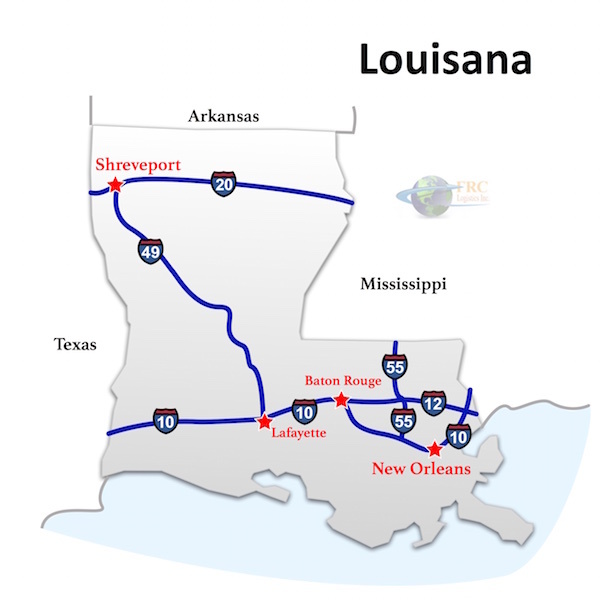 Louisiana to Illinois Freight shipping and trucking services are in high demand; Baton Rouge to Springfield is a very heavily traveled route. The Baton Rouge, LA to Springfield, IL shipping lane is a 830 mile haul that takes more than 11 hours of driving to complete. Shipping from Louisiana to Illinois ranges from a minimum of 354 miles and a minimum of 5 hours from Kilbourne, LA to Future City, IL, to over 973 miles and a minimum of 14 hours on the road from Golden Meadow, LA to Chicago, IL. The shortest route from Louisiana to Illinois is along the I-55 N corridor; however there is a more easterly route that uses the I-57 N, traveling through Mt Vernon, IL instead of Bloomsdale, MO. Home to alligators and Mardi Gras, oil refineries and shrimp boats, Louisiana is bordered by the Mississippi River to the east, Texas to the West, Arkansas to the North and the Gulf of Mexico to the south. The state’s capital city is Baton Rouge, but the cultural capital of Louisiana is without a doubt New Orleans, where the state’s French and Spanish heritage are always on display. The most tropical of all the contiguous US states, Louisiana is known for its short winters and long sultry summers, and for the hurricanes and tropical storms that sometimes sweep the Gulf Coast and flood the state’s swampy lowlands. Louisiana’s economy is based upon the state’s abundant natural and agricultural resources, whether for products they produce or for the tourism these resources generate. Important agricultural products include seafood—Louisiana supplies 90 percent of the world’s crawfish—cotton, soybeans, sugarcane and rice. Other agricultural products include cattle, poultry and dairy products. The state’s oil and coal products are also key to industry, as are chemical products, paper products and processed food. Illinois extends from Chicago on the west coast of Lake Michigan deep into the rural Midwest. Illinois borders the Great Lakes and there is a lot of freight coming into the Chicago ports. While Illinois is large, the state is flat and easy to traverse. Chicago has a vast amount of industrial companies that have commercial freight shipping needs to all points of the country and into Canada as well. Illinois has cold, snowy winters that can slow down and delay trucking through the state. 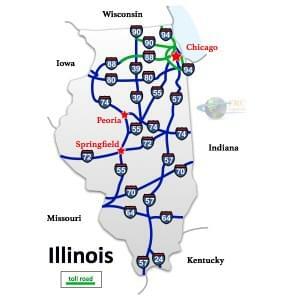 Louisiana to Illinois Freight shipping quotes and trucking rates vary at times due to the individual states industry needs. Since Louisiana is mainly agricultural, and Illinois being mainly industrial, with many food processing and distribution centers, we see plenty of shipments by refrigerated trailer. We also see a number of flatbed shipments as well as by the more common dry van trucks. Our Less Than Truckload (LTL) carriers in both Louisiana and Illinois are also running a number of regular services between the two states, and it’s an active route for heavy haul freight shipments, as well.